Philadelphia Police Officer Cyrus Mann in 2010. Hired in 2008, he shot three men in four years, was fired in 2015, but was rehired after winning an arbitration ruling. Shortly after worshiping at his Germantown mosque on the night of June 25, 2014, Gregory Porterfield was shot eight times on a street in Lawncrest. The bullets pierced his chest, back, leg, shoulder, wrist, buttocks, and an index finger, nearly killing him. On June 17, 2011, gunfire rained down on Jeremy May after he had dropped two friends at a hospital with gunshot wounds around 2 a.m. and drove his Chevrolet Suburban in the 5100 block of Duffield Street. May suffered a graze wound to an arm. Less fortunate was Hassan Pratt, an unarmed 325-pound man. Just after 6:30 p.m. Aug. 9, 2012, in a West Philadelphia alley, he was shot three times in the chest and died. Porterfield, May, and Pratt were shot by the same man — a defendant in at least six lawsuits, including three that have been settled for a combined $615,000. He was fired from his job in 2015 for killing Pratt but was rehired last year with the help of his union. 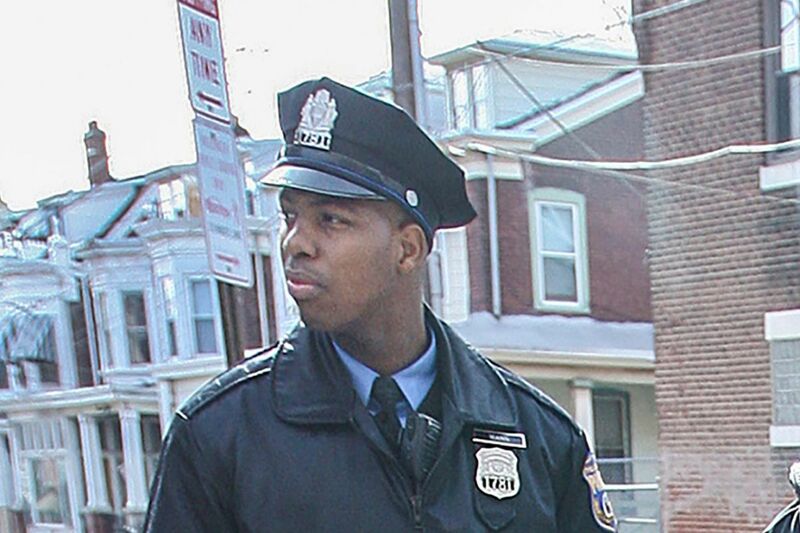 The gunman's name is Cyrus Mann, and he's a Philadelphia police officer. Mann, 33, was not criminally charged in any of the shootings, but that's not unusual. In 18 years, no Philadelphia officer has been charged in connection with an on-duty shooting. Pieced together from interviews, lawsuit filings, and confidential records, the details of Mann's shootings, his firing, and reinstatement have never before been made public. His continued employment shows how hard it is for the department to get rid of cops it doesn't want. Gregory Porterfield points to a spot on his shoulder where he was shot by Philadelphia Police Officer Cyrus Mann. Mann won his job back at least in part because of one sobering fact: The only witness to the fatal shooting was the man he killed — Pratt. "There was no camera, no other officers, and no civilian witnesses," Ralph H. Colflesh Jr., the arbitrator who ruled that he must be rehired, said in an interview. "My hands were pretty much tied." The department is reluctant to discuss Mann's record. A Philadelphia police spokesman, Capt. Sekou Kinebrew, said only that Mann "would be an example of a person who the department wanted to terminate, but he got his job back." Scrutiny of police-related killings has intensified in the last three years, stoked in part by racially tinged cases in places including Ferguson, Mo., and Baltimore. But in Mann's case, he is, like his three gunshot victims, African American. Mann declined requests to be interviewed for this article and did not respond to a certified letter. Officials of the Fraternal Order of Police Lodge 5, Mann's union, did not respond to requests for comment. The three shootings put him in a select group in the 6,500-officer Philadelphia Police Department: Between 2007 and 2013, just 12 officers were involved in three shootings, while three officers were involved in four, according to a U.S. Justice Department study on the department's use of deadly force. Most police officers "will never have to shoot someone in their careers," said Chuck Wexler, executive director of the Police Executive Research Forum, a Washington-based group that works with urban police departments. "It's exceedingly rare that you would have an officer to have three shootings in three years." Mann's use of arbitration to win back his job is not unprecedented. Between 2012 and 2016, the Police Department dismissed 85 officers. Nine were reinstated after their grievances were sustained by independent arbitrators, and 19 more await rulings, according to department data provided to the Inquirer and Daily News. Porterfield, a 58-year-old retired maintenance worker, has cited Mann's prior shootings in a lawsuit against the city, the officer, and his former patrol partner, Joseph Reiber. "There has to be a problem with a person who shoots so many people," Porterfield said. He said he has permanent nerve damage and numbness in his right leg, a severe permanent limp, and decreased mobility in his left arm, and has lost the knuckle on his left index finger. "I go to make a step, and sometimes there's no feeling in it," he said at the Center City office of his lawyer, Paul Hetznecker. "I can't make a fist and I can't close my left hand. It's just one thing after another." Hetznecker said Mann's ability to retain his job is "essentially ratifying the systemic culture within the Police Department over the decades that: 'We're not going to discipline our own. We're not going to charge those who happen to wear a badge when they use excessive force.' "
The actual number of officers the department attempts — and fails — to fire could be much higher than the data show. Those figures do not include officers who won arbitration rulings in which they not only got their jobs back but had their terminations expunged — or wiped clean — from department records. Kinebrew, the Police Department spokesman, said he was not at liberty to release that number. Confidential arbitration documents obtained by the Inquirer and Daily News show that Mann is among the officers whose firings have been wiped from the department's records. The same is true for six narcotics unit cops accused — and later acquitted — on charges they were shaking down drug dealers. And it's true for Lt. Jonathan Josey, who made national news when he was caught on a cellphone camera striking and knocking down a woman after the 2012 Puerto Rican Day Parade. Mann was fired by then-Commissioner Charles H. Ramsey in July 2015 after a nearly three-year investigation that determined that his shooting of the unarmed Pratt was unwarranted after a traffic stop that turned into a foot chase. In December 2013, the city paid $465,000 to Pratt's father to settle a wrongful-death lawsuit against the city and Mann. The lawsuit said Pratt became frightened and ran after Mann's partner ordered him from the car and began searching him — actions described as "unnecessary," "overly aggressive," and "improper." Ramsey's decision to fire Mann may have been "rationally influenced" by the officer's prior discipline for shooting May, for which he was suspended for four days, a Police Department official testified during the arbitration hearing, according to the March 2016 reinstatement ruling. In overturning Mann's termination, arbitrator Colflesh took as fact the officer's testimony that Pratt had posed a threat because he had reached for his waistband, where criminals often carry guns, he noted, and lunged for the officer's Taser and gun. Colflesh also noted that the Police Department's case was weakened because Mann was the lone living witness. "The burden that the city has in a case like that is, they have to prove that Mann's actions were inappropriate, and without any evidence whatsoever they couldn't do it," Colflesh said. "It wasn't that they didn't have enough evidence. They didn't have any evidence." The ruling returned Mann to the force with back pay and no blemish on his record. "It can be frustrating at times, but it's part of collective bargaining," Kenebrew said. "But to be completely genuine, sometimes when we get down to those arbitration hearings, sometimes investigations could have been done better. It's not always the fault of the arbitrator. Sometimes we have to turn the mirror and look at ourselves." Wexler, of the Police Executive Research Forum, said rulings by outside arbitrators overturning officer terminations bring "enormous frustration" to police chiefs nationwide. The Washington Post reported this month that more than a quarter of 1,800 big-city officers fired for misconduct since 2006 had won their jobs back in arbitration hearings. "The citizens of Philadelphia need to put a spotlight on the arbitration process, and they have to ask themselves: Is justice being served?" Wexler said. "It just undercuts the whole accountability process. I'm not saying everyone is not entitled to fairness. I'm simply saying the arbitration process is skewed to make it difficult to get rid of problem employees." Colflesh, who in October will become the Mid-Atlantic coordinator for the National Academy of Arbitrators, said data might suggest a disproportionate number of wins for the police union, but, he said, that's because the unions pick the right battles. "They bring the cases that they think they can win. They and their lawyers are not stupid," he said. "It's not a perfect world. The alternative is to have no system at all, to have the employer say, 'I think you're guilty, you're fired, your career is over.' "
This month, the city and union representing officers agreed to a new three-year contract. The pact doesn't include any significant changes to the arbitration or grievance process. No one has definitive data on the percentage of police officers in the United States who have shot people in the line of duty. Still, numerous studies suggest that the numbers are in the low single digits. The Philadelphia District Attorney's Office last charged an on-duty officer for a shooting in 1999. But while Mann patrols Roxborough, questions about his three shootings remain, specifically about how his official version of events contradicts key evidence gathered by city investigators. Porterfield said that Mann and his partner, Reiber, never said why they stopped him at 9:20 p.m. after he left a worship service, parked briefly, and was driving a friend to get something to eat. Mann later would tell investigators that Porterfield was stopped because one of his brake lights was out. Defense attorney R. Patrick Link said his investigation "conclusively determined that the brake light was not malfunctioning at the time of the stop, which was the entire reason for the encounter." Mann told investigators that Porterfield seemed nervous, so he ordered him to get out of the car. When Mann asked if he had any weapons, Porterfield said, he told the officer that he had a handgun in his pocket. He carried the gun for protection after a son had been murdered in 2010, although he had no license, Porterfield said. "That's when a series of events kicks off and Greg puts his hands in the air to clearly demonstrate that he does not have a weapon in his hand, and he's shot in the back," said attorney Hetznecker. Mann and Reiber, in sworn statements to Internal Affairs investigators, said they opened fire on Porterfield after he drew his gun and fired at them. Both officers said they heard the gun discharge and saw muzzle flash. The Internal Affairs investigation found no fired cartridge casings from Porterfield's gun, but found lint in the barrel, suggesting it had not been recently fired. "There was no evidence to support the officer's allegations that Gregory Porterfield discharged his semi-automatic handgun at the officers," according to the Internal Affairs report. The District Attorney's Office in June 2015 dropped two counts of attempted murder, two counts of aggravated assault, and firearm charges against Porterfield, despite the claims of the officers. Mann and Reiber were not cited for lying and faced no discipline for the shooting. Porterfield, meanwhile, was prosecuted and given probation for prescription pills found in his car. In the June 2011 shooting of May, now 38, Mann told investigators he opened fire because he thought May was holding a gun while trying to run him over with his car. When other officers stopped May's car blocks from the shooting, he was found not to have a gun. The incident began when May — who had nine mostly minor criminal convictions dating to 1998 — and his brother Joseph drove two friends who had been shot to Aria-Frankford Hospital and left without speaking to police, who then gave chase. At one point, Mann got out of his car and continued the pursuit on foot. In 2013, a jury acquitted May of aggravated assault and simple assault, while finding him guilty of possession of an instrument of crime — the car — for which he was sentenced to 2½ to five years in prison. The Police Department cited Mann for violating the policy prohibiting shooting at moving cars and suspended him for four days without pay. The fatal shooting of Pratt, 28, followed an August 2012 traffic stop near 56th Street and Walton Avenue, according to the lawsuit filed by Pratt's father. Mann and his partner had made a U-turn and pulled over a Ford driven by Sean Salters, a relative of Pratt's. Pratt and his brother Mikaal were passengers. The officers told the three men that they were stopped because Salters had made an illegal turn, which Salters disputes. The officers ordered the Pratt brothers out of the car and began searching them without legal justification, according to the lawsuit filed by Pratt's father. The unarmed Pratt — who had previous convictions for theft and drug possession but had recently graduated from an electrical trade school — became frightened, took off running, and ended up in an alley where Mann fatally shot him. Meanwhile, Porterfield relives his shooting every day. "I have this fear now, I don't have to hear gunshots, I have a fear of police," said the married father of two. "I have a fear of police that I just can't shake."